Ok, this blog is normally about server virtualization, but I thought I might digress into a slighly-off-topic realm today, to bring some opinions on a product I’ve been using for some time, called Parallels Desktop. This is the program that gets the little text box at the bottom of the “Run Windows and Mac” commercials. You know the ones, John Hodgeman, with the many-titled commentator/reporter from The Daily Show and Justin Long, the guy from about a million small roles. I’ve been using it for some time, having the need to run such things as Visio and Access, as well as my custom MMC for all our Windows server management, and VirtualCenter to manage our VMware environment from my Mac. 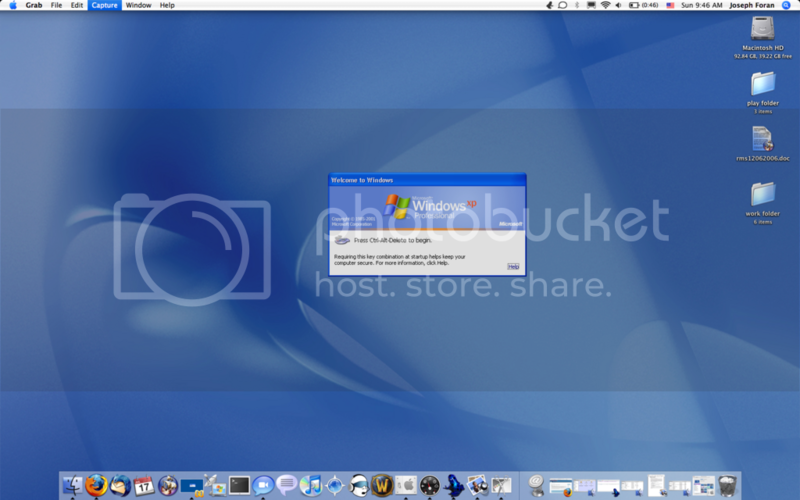 Parallels is one of the two ways to get windows working on your mac, and until the recent release of VMware’s Fusion beta, the only virtualized way, and I use it all the time. I don’t play the upgrade game with applications that I need on a daily basis, so I’ve been running a slightly older build for a while, at least until my curiousity about Coherence got the better of me. So, I fire up my XP machine after the upgrade, and click the button for Coherence. What do I see – A Control-Alt-Delete box in the middle of my Mac. Hilarity. True hilarity. Function-Control-Alt-Delete and I’m in. Yuck. My first non-enjoyable part of Coherence… lets hope that it’s my last. The Windows taskbar has just invaded my Mac desktop. Start button, quick launch, and system tray… my favorites (not!). Easy to dispel… just a simple click in the options box and they’re gone. Getting back to the Start button is easy – just a double-click on the parallels icon and I have my menu. Some re-arrangement of what I have pinned there vs. what I used to keep in my quick launch tray, and I’m ready to roll. Windows command prompt. Adobe Designer. IE7. All working. Everything is working. My shared folders between the virtual and the physcial mac means I can move docs back and forth. What about drag and drop? Works like a charm. It even pops up a box that lets me choose what access I give Parallels. The whole kit and kaboodle looks like this. You can see that the app creates icons in my dock, just as if they were Mac programs. You can see a couple of Mac-native apps running, like iChat, Grab, Thunderbird, and Firefox. I fired up my VMware Server management console to connect to the test lab, and sure enough, it worked great. It feels native. It’s seamless once I’m past that warning box. It’s simplicity is brilliant. What it means for the deskop is obvious. It means no more worrying about running legacy apps. Got a must-use app for Win9x? Need to run a Windows app on a Linux desktop, and WINE can’t run it? All possible… not with Parallels specifically, but the technology in general. It won’t be long before other products are out there that do these things, that take advantage of this huge conceptual leap in client-side application virtualization. Imagine a Linux client, talking to a Citrix server that is hosting Mac and Windows apps, and sharing them via http. Wow. Off-topic a bit? Yes. But keep this kind of converged (Coherent?) virtualization approach in mind as the line between operating systems continues to blur in the server market. Will we one day see one server serving applications to end-users, customers, etc. from a virtualized environment similar to Coherence? I wonder what this means for streamed applications, like those pushed out via Citrix? Will Citrix take advantage of this kind of technology in its own app virtualization products? One can only hope. What will this do for sandboxed applications? It’s a bit off in the future, but expect this sort of innovation to make it’s way upstream in any number of ways. One thing I forgot to mention - If you make an application a "favorite" in Parallels, you get a desktop icon on your Mac on it. To create a favrotie, just open the app, right click on the dock icon, and add it. For example, I have Visio as a favorite, and while you can't see it in my desktop image that I linked, if I double click it, the VM starts, I log in, and Visio launches. Very Citrix-esque.